Does anyone know the story behind Fish Rocks? A friend and I were talking about this topic on a trip to RC last week and neither of us knew when the rocks were first painted to look like fish. And what is the story about a troll that lives under the highway by Fish Rocks? 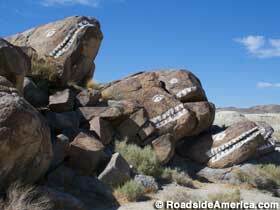 Between Ridgecrest and Trona, there are the Fish Rocks -- an outcropping of stones painted with eyes and teeth -- in Poison Canyon, not far from the turn-off for the Trona Pinnacles. Some call them the "Whale Rocks," but they're more commonly the "Fish Rocks" or "Fish Head Rocks." Poison Canyon, officially Salt Wells Canyon, was plagued with graffiti (and still is). The Fish Rocks came about some time in the 1930s or '40s (some claim even earlier, 1928) and became a favored landmark with the locals. When the heads were painted over in colors meant to match the pinks and beiges of the natural stone, along with the rest of the graffiti, the people of Ridgecrest and Trona became infuriated with the loss of their bizarre, though beloved Fish Heads. Someone repainted the eyes and teeth about a year later and this time they stuck and became protected. The Fish Heads can be seen off Highway 178. There are a couple dirt road pull-offs on the western side and you can walk right up to them. Though there is some graffiti on the surrounding rocks (a Mercedes sign I'm sure was meant to be peace, for example), but the Fish Heads are pristine. They're pretty trippy in person. The eyes and teeth are only painted on one side -- you only really see them heading northbound, from Ridgecrest to Trona. My boyfriend's dad was saying his friends used to throw beer bottles at them as they drove back to Ridgecrest from the factory in Trona at the end of the day. Back then the highway went right beside them. A dirt road goes right by them, but is broken up into a wash. Here are some old and new pictures of fish head rocks. Huge difference between now and then. CactusHugger wrote: Does anyone know the story behind Fish Rocks? A friend and I were talking about this topic on a trip to RC last week and neither of us knew when the rocks were first painted to look like fish. And what is the story about a troll that lives under the highway by Fish Rocks? When I was younger the driver honked when we went by where drainage pipes were located and you had to pick your feet up off the floor of the car. It has something to do with the way the road used to go before they made the road wider and moved it over a little further away from the fish. Apparently there's something irresistible about all that bare rock right next to the road. Even back in the 1930s people just couldn't help themselves. I suppose this is surprising since we tend to think of graffiti as a modern problem when actually it's something that people have been doing for a long time. I suppose even petroglyphs left by ancient humans were really nothing more than an ancient form of graffiti. I guess the difference between graffiti and art is in the eye of the beholder. I wouldn't really call fish head rocks graffiti because it looks cool. If you want to get technical painting over graffiti with neutral colors is also graffiti in a kind of sort of way. I think most graffiti looks better painted over but I feel the fish head rocks should be protected. I wonder what actually protects them? Are they offically designated by someone or something? Nancy Reed here! I was surprised to see myself in the news after all these years. Yes, it was I who re-painted the Fish Rocks along with Claudia Grandjean. We got into a big heap of trouble over that little stunt. We were not arrested or cited we were just detained for questioning. A few weeks later the Chamber of Commerce in Trona decided our fate. They gave us a deal we couldn't refuse. If we painted over all the incidental artwork we could leave the fish rocks and not be in trouble any more. We were more than too happy to comply. That's actually a pretty cool story! Here's another site with a little info about this local roadside attraction. At the east end of the appealingly named Poison Canyon is a formation of rocks painted to resemble giant, toothy fish. Also known as the "Whale Rocks" or "Fish Head Rocks," the imaginative decoration is believed to have been added in the 1930s.